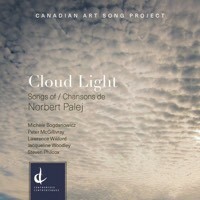 Palej: Cloud Light | Lawrence Wiliford | Dispeker Artists, Inc.
Lawrence Wiliford is a featured soloist in this first recording exclusively devoted to the music of Polish-born Canadian composer Norbert Palej. CLOUD LIGHT immerses listeners in music that actively grapples with the modern understanding of art song and demonstrates that it is still a genre capable of the most profound musical expression and innovation. Featuring new songs written for and premiered by mezzo-soprano Michèle Bogdanowicz, baritone Peter McGillivray, tenor Lawrence Wiliford, soprano Jacqueline Woodley and pianist Steven Philcox, this exploration of 21st - century Canadian art song presents four works: Three Norwegian Songs (2011) for baritone and piano, Four Lyrical Moments (2013) for mezzo-soprano and piano, Cloud Light: Fourteen Small Songs (2012) performed by soprano, tenor and piano and The Demise of Argus Panoptes (2015) for SATB quartet and piano.